Today's theme is our "40 Half-Court Press Break"
The defense is in a half-court press. 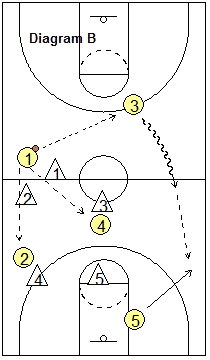 A common half-court press is the 1-2-2 (or 3-2). 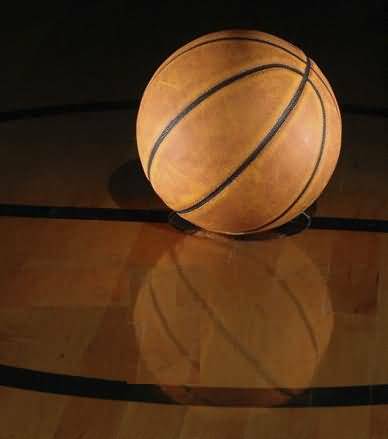 This half-court press-breaker will work against most half-court presses. What the defense is trying to do is force O1 (or a pass) to the sideline just inside half-court where they can easily trap. They will "invite" the point guard to come across on the side and then trap. See diagram A below for our setup. O5 goes deep. O2 is up the sideline. 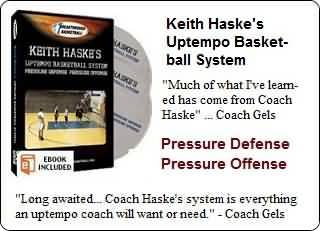 O1 brings the ball up and moves to one side to get the defense to commit to him/her. Very important... O3 always stays back behind O1 a couple steps, on the opposite side. O4 moves to the "center of the box" created by X2, X3, X4 and X5 and the pass could go to there. See Diagram B. Our preference is for O1 to move to the side but stop short of half-court, back dribble a couple dribbles and pass quickly over to O3 on the opposite side. With the defense shifted to the right, O3 now dribbles quickly across half-court. Once O5 sees the pass go to O3, he/she cuts out to the 3-point arc to get the next pass from O3. 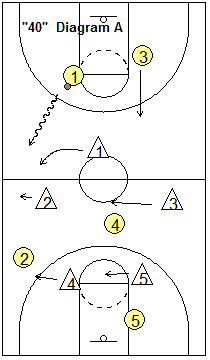 O4 then cuts to the hoop, looking for the pass from O3 and the layup (Diagram C). Although not a great option for youth teams (skip-passing is too weak), another option is a skip-pass from O3 across to O2 on the right wing. This would usually occur after O3 has made a couple dribbles up the left sideline and the defense has shifted back over. O2 would drop deeper toward the corner for this pass. This pass will often be open after you have previously hit O4 cutting to the hoop (which causes the defenders to drop back inside). One other thing... when O1 reverses the ball back over to O3 (diagram B), O1 must then drop back behind O3. Sometimes against really quick teams, we may have to re-reverse it back from O3 to O1, and then O1 attacks up the right side, but quickly as we are now getting close to the 10-second limit. Another final point... defenses are used to forcing the point guard and offense up the right sideline, and often put their best defenders on that side. 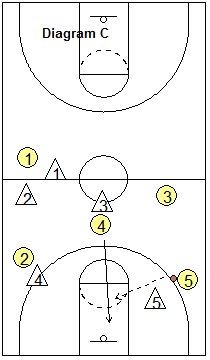 If O3 is a good ball-handler, you might start the offense with O3 dribbling up the left side (mirror image of the offense), and O1 would stay back for the reversal pass and a subsequent right sideline attack. 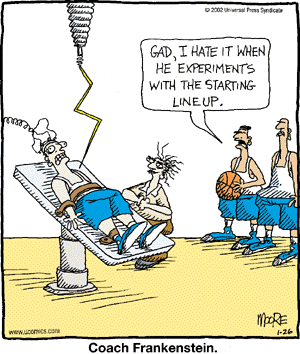 We find that this is a good half-court press attack that works pretty well against most half-court presses.